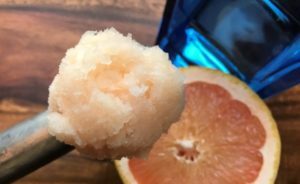 We’re really proud of our Gin & Pink Grapefruit Sorbet from our Truly Alcoholic range. After lots of experimenting and many rejects we landed on the perfect recipe last year, and it’s proving to be really popular. The initial zing of fresh pink grapefruit is followed by the distinct flavour of London Dry Botanical Gin. Perfect for summer, simply serve with a slice of fresh grapefuit. Available from licensed outlets including Forest & Wye Valley Camping, St. Briavels. See more of our Truly Alcoholic range for grown-ups here.